South Africa is well on its way to entering exclusive defence industry terrain through Milkor. The company’s unmistakeable dominance at the Africa Aerospace and Defence (AAD) exhibition in 2018 has fuelled successful new research and development initiatives. Currently, any interaction with their well-trained sales team will elicit the smug comment: “For nearly 40 years Milkor has been world-renowned for its grenade launchers – more than 60 000 launchers have been delivered to over 60 customers around the world.” Now, this is old news and not the most significant of Milkor’s achievements. Milkor is now part of a handful of elite companies around the world producing armed unmanned aerial vehicles (UAVs). Its first UAV weapon is a small diameter laser-guided bomb. The 12-metre wingspan MA380 will carry two of these weapons. Milkor’s smaller MA80 may be able to carry one laser-guided bomb. The company’s third UAV, the hand-launched MA18, is built for tactical surveillance and is unarmed. Apart from weapons, mission equipment on the larger UAVs includes electro-optical/infrared sensors, synthetic aperture radar (SAR) and communications/signals/electronic intelligence payloads. This makes Milkor’s UAVs more attractive to defence and security customers. With lofty ambitions to become one of South Africa’s biggest defence and security companies, Milkor has been successfully expanding into the aerospace, maritime and land systems markets. 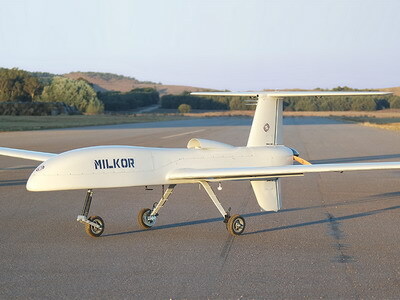 Within the space of a year, Milkor has designed, engineered and manufactured three unmanned aerial vehicles, a naval system and a 4×4 armoured personnel carrier. These projects are purely South African initiatives, using the majority of locally-sourced components. Milkor sees this as helping develop the local defence industry, boosting the economy and benefiting the South African National Defence Force (SANDF). The SANDF already proudly uses Milkor’s grenade launchers. The most recent delivery of a new order of Y4 six-shot launchers took place in the first week of February 2019. Does the future of the Defence industry include a strategic alliance between Milkor and Denel? Building on decades of human capital experience within its pool of engineers, Milkor is well-armed to help Denel recover its international standing. If the intention is to lift a fraction of the country’s skills deficit and ensure that the defence industry is an impactful contributor to the South African economy, the answer to the question posed is yes. Milkor is heavily invested in building the South African defence industry and enhancing its global reputation, making South Africa a prime choice for defence technology. Milkor has agility and flexibility on its side, priming it to operate alongside defence giants like Denel. Milkor has built up an international reputation with its grenade launchers, and aims to create a similarly solid reputation with the design and manufacture of armoured vehicles, UAVs, naval systems, sniper rifles and cyber security products. Milkor’s products are ITAR free, making them attractive to a large number of markets. Its systems are fitted with a wide array of customisable features including sensors and weapons depending on end-user specifications.